PANAYIOTIS DEMOPOULOS (b.1977): Theme and Variations on a villota by Filippo Azzaiolo, 3 Songs for Bass and Piano, Of Seventh Doors for Cello and Piano, MAHIR CETIZ (b.1977): Mist Bells for Small Ensemble, Triptych for Solo Piano, Polarisation for Solo Bassoon. Description: These two composers are exact contemporaries, friends, students of the British composer Anthony Gilbert, and perform as pianists on each others' pieces here, but their æsthetics are noticeably different. Cetiz' pieces are more obviously modernistic, while Demoploulos draws on the past to a greater degree, though both depart significantly from tonality much of the time. Cetiz' Mist Bells delivers what the title promises; the sounds of bells approaching and receding through planes of misty textures, while his Triptych uses dense chords with something of Messiaen about them in a piece based on Anatolian Sufi rituals. Polarization explores the timbral and dynamic potential of the bassoon. Demopoulos’ Variations are based on a 16th-century villota, quoted literally at the beginning and end and revisited in successively diminished form as a ritornello between the variations, each of which references a different style from musical history. The songs derive from the romantic lieder tradition, though in more modern harmonic language and with some extended techniques in the piano part; the central one sets a poem by Ursula Vaughan Williams. The seven doors in the cello and piano suite are those of Bartók's Bluebeard's Castle, by which Demopoulos was inspired to compose this work in his own idiom, loaded with oblique references to Bartók's opera. 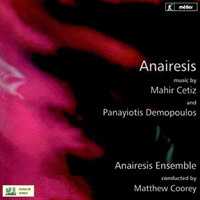 Anairesis Ensemble; Matthew Coorey. Original 2003 Dunelm release.